We’d love your help. 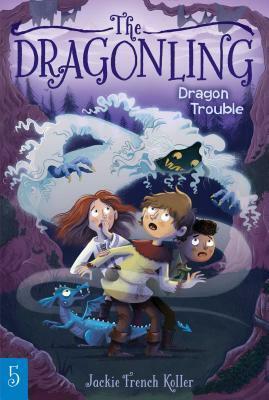 Let us know what’s wrong with this preview of Dragon Trouble by Jackie French Koller. Darek must rescue Zantor and Pola from the dangerous mists of Krad in this fifth book in the fantastical Dragonling chapter book series! When Darek’s beloved dragonling, Zantor, and Darek’s best friend, Pola, disappear into the mists of Krad, everyone assumes they’re gone for good. But Darek just knows that Zantor and Pola are alive. He can hear the dragonling’s cries for h Darek must rescue Zantor and Pola from the dangerous mists of Krad in this fifth book in the fantastical Dragonling chapter book series! When Darek’s beloved dragonling, Zantor, and Darek’s best friend, Pola, disappear into the mists of Krad, everyone assumes they’re gone for good. But Darek just knows that Zantor and Pola are alive. He can hear the dragonling’s cries for help, deep inside his own head. And much to his surprise, Rowena—the cause of all the trouble—hears them, too. To ask other readers questions about Dragon Trouble, please sign up. Jackie French Koller (born 1948) is an American author of picture books, chapter books, and novels for children and young adults. She lives and writes in western Massachusetts. Koller is also an accomplished painter. Her interest in art inspired her to open The Little Black Dog Gallery in Westfield, Massachusetts. Koller's young-adult novel If I Had One Wish was adapted into a Disney Channel Origina Jackie French Koller (born 1948) is an American author of picture books, chapter books, and novels for children and young adults. She lives and writes in western Massachusetts.